Foam is highly adhesive, and dried foam is very difficult to remove. Wear gloves, eye protection, a hat and work clothes. Cover any areas you do not want exposed to foam. Use drop cloths when working with polyurethane foam. Read all instructions on package. Make sure surface is free of oil and dirt. Polyurethane foam sealants require some humidity in order to cure properly. For best results, apply in temperatures between 60-100°F (16-38°C). Allow foam to cure fully before replacing baseboards, window or door frames. Shake the can of foam for no more than 30 seconds. Shaking for more than 30 seconds may result in less foam yield. Always test application on scrap material first. Release trigger before reaching end of gap as foam continues to dispense for several seconds after trigger is released. Do not overfill gaps – fill gaps 1/3 full, allow room for foam to expand. Clean spills immediately (before foam dries) with acetone or nail polish remover containing acetone. DO NOT USE WATER. Do not attempt to remove cured foam with solvents. Cured foam wears off and is not harmful to health. (moisture helps to cure foam). Paint outdoor applications to avoid discoloration. Wait until foam is rigid before painting or trimming (30-60 minutes). Landscape foam is UV resistant and will not discolor or break down in sunlight. 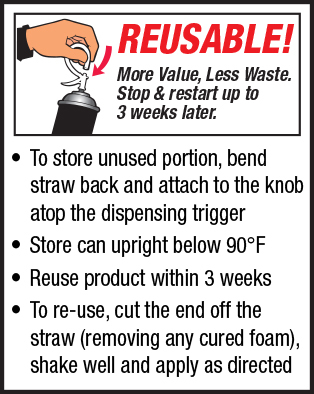 For reusable dispensing, leave straw attached, folding over and attaching to white knob on dispensing trigger. Store aerosol can upright to avoid propellant leakage prior to use.